When President Donald Trump nominated federal appeals court judge Neil Gorsuch to fill the Supreme Court seat left vacant by the death last year of Justice Antonin Scalia, he chose a candidate whose professional background is very much in line with previous and current justices. Like Gorsuch, many of the 112 former or sitting justices had previously worked in the U.S. Department of Justice, appellate courts or private practice. If confirmed, Gorsuch, who currently serves on the 10th U.S. 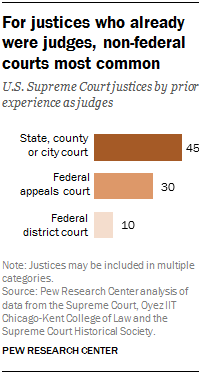 Circuit Court of Appeals in Colorado, would join at least 68 others with prior experience as judges. Of these, at least 30 also came from U.S. appellate courts. 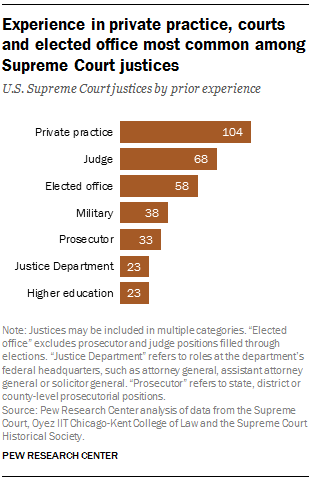 And like the vast majority of Supreme Court justices – 104 so far – Gorsuch would bring private practice experience to the court. While less common, Gorsuch’s previous role as principal deputy to the associate attorney general puts him in line with at least 23 justices who served in the U.S. Department of Justice. Unlike a majority of justices, however, Gorsuch has never been elected to any public office, a Pew Research Center analysis of biographical information from the Supreme Court and other sources has found. Gorsuch also would join the ranks of Ivy League-educated justices who have served on the court. Just over half of all current and former justices went to an Ivy League institution. In fact, each of the current justices attended one of two particular Ivy League schools: Harvard or Yale. Gorsuch earned his bachelor’s and law degrees from Columbia and Harvard, respectively, as well as a doctorate from Oxford. Gorsuch would be among the long list of white, non-Hispanic men on the nation’s highest court. Every former Supreme Court justice was white and of European descent until Thurgood Marshall, the first African American justice, was named to the court in 1967. Since then, just two nonwhite members have been appointed to the high court: Clarence Thomas in 1991 (the country’s second black justice) and Sonia Sotomayor in 2009 (the country’s first Hispanic justice). Of the sitting members, Ruth Bader Ginsburg, Elena Kagan and Sonia Sotomayor are three of just four female justices in the court’s history, following Sandra Day O’Connor in 1981. Born in Denver, Gorsuch would be the second Supreme Court justice from Colorado and just the third from the entire Mountain States region of the U.S. And more former justices were born in another country – a total of six – than were born in the entire Western region of the U.S. (five total). George Washington nominated three justices born abroad: William Paterson, James Iredell and James Wilson (all from the modern-day United Kingdom). The other foreign-born justices to join the court were David J. Brewer in 1890 (from modern-day Turkey), George Sutherland in 1922 (UK) and Felix Frankfurter in 1939 (Austria). At 49, Gorsuch would be a relatively young member of the court: 74 of 104 former justices were ages 50 or older at the time they took the oath of office. Among all former justices, new members were an average of 53 years old when sworn in, served for an average 16.9 years and ended their tenure at an average age of 69. Correction (June 11, 2018): A previous version of this post incorrectly stated that, as of March 2017, all current U.S. Supreme Court justices had earned at least one degree from Harvard or Yale. Ruth Bader Ginsburg attended Harvard but earned her law degree from Columbia.